‘Whenever there is a large dispute, or a large number of disputes ... it indicates that there was some major disagreement between the government agency and the private property owner regarding the value of the property taken,’ said Carl Sammartino, an attorney who represented several of the affected owners. — Woodhouse, Murphy. (2017, September 18). Road Runner: Decades in the making, downtown bypass in sight. Arizona Daily Star, pp. A2, A5. Please refer to my page of reviews on AVVO to see how my clients felt about the results I obtained for them as their eminent domain lawyer. You can also find the original Arizona Daily Star article here on the Star's website or permanently cached here. In Southern Arizona, The Regional Transportation Authority (RTA) is a major source of condemnation cases - cases in which government entities use the power of eminent domain to take private property needed for public-works projects. The RTA plan is a 20-year plan, approved by voters in 2006, that mandates improvements to many roadways in Tucson. As you can see, Broadway Boulevard, Silverbell Road, Valencia Road, 22nd Street, Grant Road, 1st Avenue, and Tangerine Road are still slated for major improvements. Many property owners who have asked me to represent them when their property has been taken through eminent domain express surprise at how quickly the process moves once the government decides their property is needed for a project. Property owners along these roadways should be prepared for the major disruption that can occur during an eminent domain taking. Having an experienced eminent domain lawyer can help to answer many of the questions that are sure to arise during the process. This May, the Board of Legal Specialization of the State Bar of Arizona certified me as a specialist in real estate law. Certification requires admission to practice for at least seven years, substantial legal practice in the area of real estate for a period of five years, the Board's recommendation after application and references, and passing an examination, which I took and passed in April. I am proud to have met these rigorous standards. The State Bar of Arizona currently lists 72 board-certified-real-estate-law specialists in the State of Arizona, and only 15 of those have primary offices in Pima County. If you are looking for help resolving a real estate related legal issue, I highly recommend you seek the advice of one of those specialists. The specialist certification is the only designation the State Bar of Arizona grants to certify a particular lawyer practices mainly within one area of the law. Moving as a result of eminent domain? As the Broadway Boulevard widening project gets underway, relocation agents working for the City of Tucson have begun to contact property owners along the path of the project. The Broadway widening has languished for many years but, in spite of that, once the relocation agents contact property owners, things start to move towards property acquisition fairly quickly. What should a property owner expect through the relocation process, and how can a property owner ensure he or she receives all of the money to which he or she is entitled through the eminent domain process? Reach out your hand if your pots be empty / If your pots are full, may they be again. Pot A is "Just Compensation" - the amount of money the Arizona Constitution guarantees a property owner in exchange for the real estate taken from him or her. Pot B is "Relocation Benefits," which is an amount designed to pay for moving the personal property and reestablishing the business or residence of the property owner at a new property the property owner purchases with the funds from Pot A (or other funds the property owner wishes to spend). If the City of Tucson is taking your property for the Broadway project or any other public improvement, you are certainly entitled to Pot A, and you may be entitled to Pot B funds as well. My practice has traditionally focused exclusively on extracting the most Pot A - Just Compensation funds I could for a property-owner client. Clients usually choose to hire me to seek the most Just Compensation possible and sort out Pot B - Relocation Benefits on their own. Recently, a shift has occurred, and more clients are asking for help in securing their Relocation Benefits. The reason is those clients believe the relocation agents working for the City of Tucson are not doing a good job guiding the property-owner clients through the relocation process and, instead, seek only to maximize savings to the City of Tucson rather than fairly distributing the Relocation Benefits these clients deserve. One example of this unfairness is the rules the City of Tucson and its relocation agents use to determine a property owner's eligibility for Relocation Benefits. There are three sources of a property owner's entitlement to Relocation Benefits: a federal source applicable to federal projects and state projects receiving federal funds, a state source applicable to Arizona Department of Transportation Projects, and a state source applicable to all other state- and local-level projects. This last source of Relocation Benefits requires the City of Tucson to establish its own rules governing the distribution of Relocation Benefits, but the City of Tucson has not done so. Instead, the relocation agents representing the City of Tucson use the oftentimes restrictive federal source and the guidelines pertaining to it. This confusion has resulted in clients reporting unfair and bizarre treatment from relocation agents who do not seem to have the appropriate guidance from the city. If you believe the City of Tucson or its hired relocation agents are not treating you fairly, call me for a free consultation. I would be more than happy to review the amounts to which you may be entitled and discuss a fair fee to seek the recovery of those amounts. As many Tucsonans are aware, the Tucson voters passed the $2.1B Regional Transportation Authority (RTA) plan in May of 2006. Since then, the RTA has been working on delivering 35 roadway corridor projects that impact Tucson and Pima County property owners. 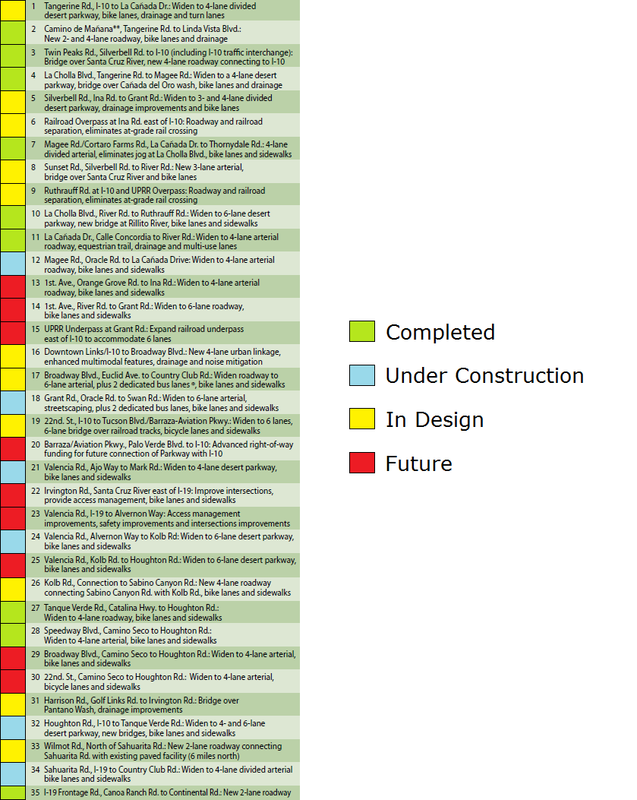 Of these 35 projects, most of them require the implementing agency to acquire private property through eminent domain. The RTA has completed 9 projects, is currently constructing 6, is designing 11, and is waiting to begin 9 future projects. The 20 projects in-design or for the future (and even some of the projects under construction, like Grant Road) will likely require more condemnation of private property, and those property owners may want to consult an eminent domain attorney to advise them of their rights. Adventures in Land-Use Law: Who Owns that Tree? I have always believed a strong selling point for being a real estate lawyer is we get to answer such burning questions as, "Who owns the sidewalk?" or, "Can I cut down my neighbor's tree branches?" It is the latter of these two questions the Vermont Supreme Court addressed recently in Alvarez v. Katz, 2015 VT 86 (VT. 2015). And the answer? I bet you'd never guess: It depends. If your common property line passes through the trunk of the tree, the tree is a "line tree," you own the tree in common with your neighbor, and neither you nor your neighbor may destroy the tree by cutting the portion lying on one or the other side of the property line. One caveat: this is a case from Vermont, and other states are free to establish their own rules. In Arizona, it might be important whether the branches and roots are actually causing you injury. Consult a Tucson real estate lawyer who can help determine your rights to cut down tree branches and roots intruding on your property before you bring out the chainsaw.